SFBayAreaKoiClub.org - Sensory system in fish fins. 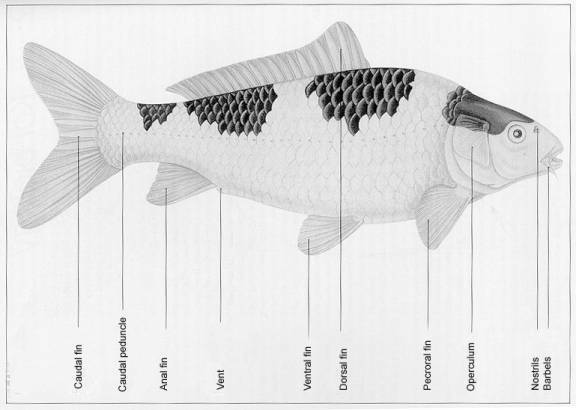 Sensory system in fish fins. As fins evolve to help fish swim, so does the nervous system. Study shows that shape and mechanics of fish fins evolve in parallel with the sensory system, tuned to swimming behavior. The sensory system in fish fins evolves in parallel to fin shape and mechanics, and is specifically tuned to work with the fish's swimming behavior, according to new research from the University of Chicago. The researchers found these parallels across a wide range of fish species, suggesting that it may occur in other animals as well. The study, published April 10, 2017 in the Proceedings of the National Academy of Sciences, combined measurements of fin shape from hundreds of specimens of the Labridae family with fin mechanical properties and neural responses recorded from eight different Labrid species, commonly known as wrasses. These measurements were then mapped on an evolutionary tree of 340 wrasses to determine how the mechanical properties and nervous systems of the fins evolved over time. "As pectoral fins evolve different shapes, behaviors, and mechanical properties, we've shown that the sensory system is also evolving with them," said Brett Aiello, a PhD student in the Department of Organismal Biology and Anatomy, and the lead author of the study. "This allows the sensory system to be tuned to the different stimuli relevant to the locomotor behaviors and fin mechanics of different species." When animals use appendages for movement, they rely on sensory feedback from those limbs to control motion. Nerves in the pectoral fins of fish detect the fin rays' position and how much they bend as they move through the water, which helps the fish sense speed and the relative position of their fins. The shape of the fin affects how the fish will move too. Scientists use a number called aspect ratio (AR) to measure this shape. High AR means the fin is long and narrow, or more wing-like; low AR means the fin is broad or round, and more paddle-like. Wrasses with high AR, wing-like fins flap them to maximize efficiency and thrust as they propel themselves forward, while those with the broader, low AR, paddle-like fins use rowing movements to maneuver close to reef bottoms. Aiello and his colleagues collected fin aspect ratio measurements from hundreds of Labrid species at the Field Museum, and combined that data with a genetic phylogeny of 340 Labrids developed by Mark Westneat, PhD, professor of Organismal Biology and Anatomy and co-author on the study. Using DNA from living fishes, Westneat constructed a family tree of relationships between these species, tracing how they evolved through time. The researchers then mapped the fin shape of each species on the phylogeny, allowing them to track fin evolution from their ancestral state to living species. The ancestral state reconstruction revealed patterns of convergent evolution, with high AR fins originating independently at least 22 times. With this history of fin evolution in place, the researchers also tested the mechanical properties and sensory system sensitivity in the pectoral fins of four pairs of closely related Labrid species, one with low AR fins and one with independently evolved high AR fins. The team tested the sensory response by measuring the neural response from the pectoral fin nerves as they bent the fin, and then repeated the process, bending the fins a different amount each time. What they found gave more clues about the utility of each kind of fin. The low AR, paddle-like fins tended to be more flexible, and the high AR fins were more stiff or rigid. But the sensory system of the wing-like, high AR fins was also more sensitive, meaning the fins were more responsive to a smaller magnitude of bending. Aiello said he believes that a more sensitive nervous system evolved in the high AR fins because it needed to be more responsive to smaller movements as the fish use these stiff, less flexible fins to swim. The work is the product of collaboration across disciplines, a hallmark of the Organismal Biology and Anatomy program at UChicago. The resulting PNAS study could have been three separate papers: the archival research of specimens from the Field Museum, the genetic phylogeny, and the neurobiological study of the living species. "Collaboration among scientists with different perspectives and expertise can take research in whole new directions," said Melina Hale, the William Rainey Harper Professor of Organismal Biology and Anatomy and senior author of the study. "It is also a lot of fun because we learn about each other's fields. For experimentalists, like us, working with colleagues and natural history collections at the Field Museum has been particularly important as they bring key insights on evolution and biodiversity." Besides giving biologists a better understanding of how fish have optimized their swimming mechanics, the results of the study could also be useful to engineers developing underwater autonomous vehicles. The propulsion systems of these devices need to be both efficient and responsive, and there are perhaps no better designs to copy than those perfected through evolution over millions of years. "A lot of the problems that engineers run into are similar to the type of things that animals have already evolved solutions to over time," Aiello said. "If we start to look more towards bio-inspired technology and incorporating some of the things we see in nature in our engineered devices, I think it will help advance and solve some of these problems more quickly."